It is very important to have a proper pool maintenance schedule. A pool that is clean is attractive and hygienic. However, it can be a lot of work to constantly manage the chemicals and cleaners used to rid your water of debris. To make maintenance easier, consider investing in a top rated solar cleaner for pools. 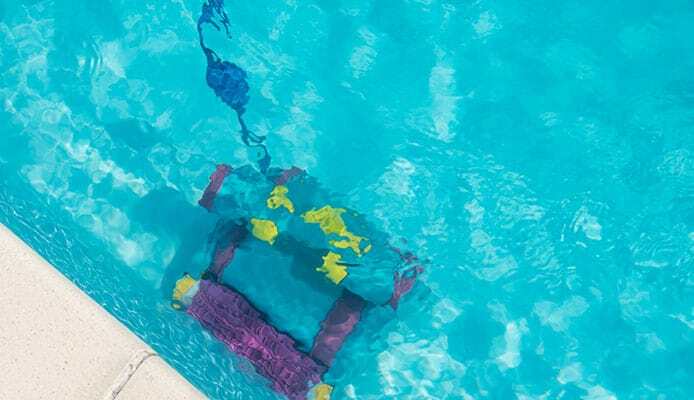 A solar powered pool cleaner is an advancement in pool technology, which uses an automatic robot that is powered by the sun to remove debris from your pool. The best solar pool cleaner will act like a pool skimmer and rid both the surface and bottom of your pool from leaves, bus, dust, and other contaminants. There are a few different models of cleaners that you will have to consider and if you don’t know what to look for, it can be overwhelming. Our guide will give you all the information you need to find the best solar pool cleaner that will make your water crystal clear. This solar breeze pool skimmer will filter and sanitize your pool using only free solar energy. It can lower your pool maintenance and energy costs and takes the hassle out of pool maintenance. It will easily skim dirt and debris from the surface of your pool, before it sinks down and eliminates decay on the bottom. The water will pass through a fine mesh filter, which traps debris like bugs and leaves. It has an on-board chlorine tray that will work to sanitize your pool as it cleans. It is easy to use and has no cords or hoses. With this solar breeze pool skimmer, you’ll never have to hand skim again. Your pool will always be swim and party ready. This Robotic Pool Surface Cleaner is solar powered and recharges throughout the day. It is automated to clean your entire pool surface, so that you don’t have to do anything. It is customizable, so that you can pick your schedule and connect it to your smartphone using an app. It is simple to use and easy to operate. Just press start, place the robot in your pool, and let it do the work for you. This model requires no hoses, cables, or cords. The battery can hold enough charge for it to function for up to 7 hours. It has a large collection basket, which is easy to remove to discard the debris. With Skimdevil’s design, you will have a clean pool every day. They ensure that you can spend less time maintaining your pool and more time enjoying it with your family and friends. Automatic pressure pool cleaners have become a popular choice for pool owners to make water maintenance easier. There are models by well-known brands with Polaris pool cleaners being a top choice, but they can consume a lot of energy. An alternative to spending energy and one that saves energy is to use solar power. Solar power has become very popular with solar pool covers and solar pool heaters being popular accessories. A pool cover can help keep debris out, but for the times when you still need to remove a fine dust or a few leaves, a solar powered pool skimmer will do the best job. There are a few different models of solar powered pool cleaners and they may have different features. It’s important to consider a few key features because they can determine what makes for a quality solar powered pool skimmer, which will ensure you have made the best investment. The type of pool that you have can affect which solar pool skimmer model would best suit your needs. Most solar powered pool cleaner designs are suitable for residential pools. 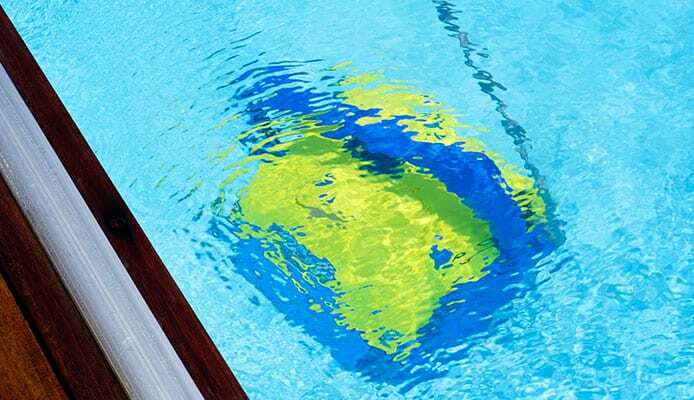 However, the size and shape of your pool may determine how well it cleans. Typically, larger and deeper pools will require more cleaning time. This means that you will have to turn on your solar pool skimmer and allow it to run for several hours. Smaller pool sizes may be completed in a few hours’ time. 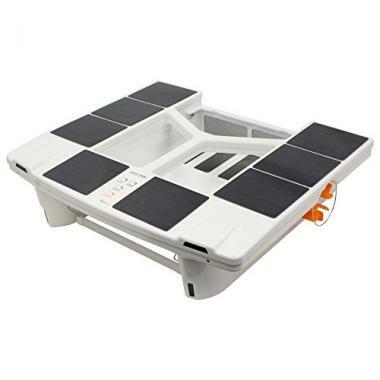 If you have a pool with lots of steps, you should be cautious with your solar powered pool cleaner. It may get stuck in corners and have trouble maneuvering odd pool shapes. Finally, it is important to determine what type of pool. The two types of pools are above ground pools and inground pools. Above ground pools, like Intex pools, feature a supporting structure that uses above ground pool liners to hold in the water. Inground pools are dug into the ground and generally are made of concrete and tile. Inground pools what most people think of when imagining a swimming pool. Not all solar powered pool skimmers can be used with both above ground and inground pools. Usually, the model will cater to a specific type of pool. Check the brand provided information before making a purchase. You wouldn’t want to invest in a solar pool skimmer that doesn’t function with your type of pool. The best solar cleaner for pool designs will be easy to use. You should be able to simply turn on the device and allow it to run automatically. A top rated solar power cleaner for pool designs can run for a short amount of time or all through the night to ensure you have a clean pool. Solar powered pool cleaners are meant to automatically clean your pool. This means that they erase the hard work of manual pool cleaners like pool skimmers. Pool maintenance will be easier and less work, which allows you to focus on checking water quality and ensuring basic pool chemistry. A top rated solar power cleaner for pools can clean any type of debris, large or small. Whether you need to remove sand from your pool or get rid of water bugs, the best solar pool cleaner can eliminate it all. You can even get rid of algae. The solar pool skimmer will collect all of the debris into a filter, which can be easily emptied. Even if you choose to invest in a solar breeze pool skimmer, you should remember that other pool factors need to be maintained too. Removing debris is only important part of pool maintenance. You will still need to follow swimming pool tips for pool maintenance. Other pool maintenance tools like pool test kits should be used to ensure you have the correct pH level in the water. Pool thermometers can also help you find the best temperature for the water. Together, with all the other required accessories for pool maintenance, a solar pool skimmer can ensure your water sparkles. Most suction pool cleaners will use the pool’s existing pump or a booster pump to run the automatic cleaner and because most people don’t run their automatic cleaners 24/7, they won’t use that much energy. However, if you want to consume the bare minimum of energy, solar power is the way to go. The best solar cleaner for pool designs won’t use any extra energy. Rather, all the energy it needs to function will be taken from the sun. You can charge your solar powered pool cleaner in the day and let it run all night long. The solar pool skimmer will have an internal battery where the solar power is stored and allows it to run. Q: How do solar pool cleaners work? A: Solar pool skimmers work by floating on the surface of the water to rid it of any debris. Once it has cleaned the surface, it will sink to the bottom where it will further eliminate contaminants from the pool. A top rated solar cleaner for pool designs will smartly navigate your pool and vacuum up any debris. However, the best solar pool cleaner will also have an integrated pool chemical dispenser. This can be used to evenly distribute pool chemicals throughout the water, which keeps it crystal clean. The solar powered pool cleaner will take energy from the sun and store it in an internal battery. This energy will be all that is required for the unit to function and maneuver it’s way around your pool. Q: Are solar pool cleaners effective? A: Yes. Solar powered pool skimmers are very effective. A top rated solar cleaner for pools can eliminate 90% of debris and contaminants. It will remove large objects like leaves and bugs, as well as smaller debris like dirt, sand, bacteria, and decay. Solar powered pool cleaners will work automatically to ensure your water is clean and clear. You will spend less energy having to manually remove debris from your pool, which makes pool maintenance much easier and less stressful. As well, solar pool cleaners can actually help you save and stop wasting pool chemicals. Some designs have an integrated pool chemical dispenser, which will disperse any necessary pool chemicals. This means that everything will be equal, and you won’t accidentally add to much or too little of a certain chemical. If you are worried about the quality or performance of a solar pool skimmer, you can also refer to solar pool cleaner reviews. 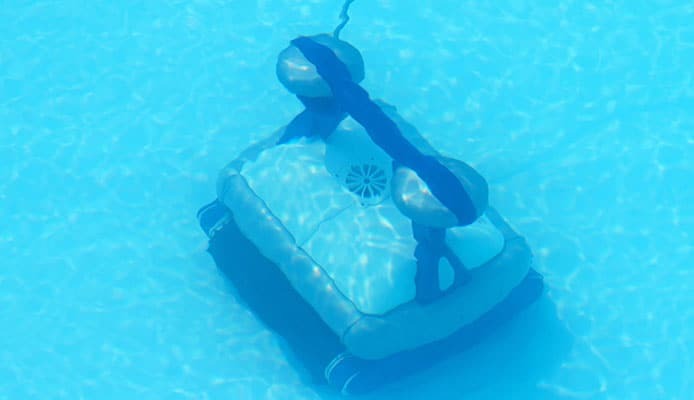 Other pool owners will often write solar pool cleaner reviews, which can tell you how effectively the model cleaned their pool and how long it has lasted for. There are lots of types of pool cleaners, but a top rated solar cleaner for pools can make pool maintenance a breeze. Automatic pool cleaners will clean while your away and a solar pool skimmer will save you energy. 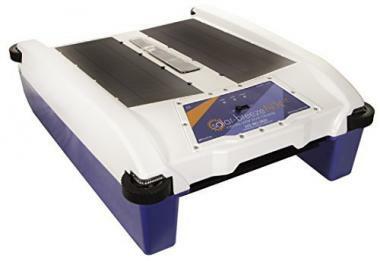 Unlike other types of automatic cleaners, a solar powered pool cleaner will clean on top and below by easily skimming the surface for debris before diving down to scrub the floor. The best solar pool cleaner will give you a gorgeous pool that will invite everyone to dive in. If you know exactly what you need, you can save time and money by investing in the best solar pool cleaner and eliminate all pool contaminants from the water. Do you own one of the solar pool cleaners that made it onto our list? Let us know how it has worked for your pool maintenance needs in the comments section below.